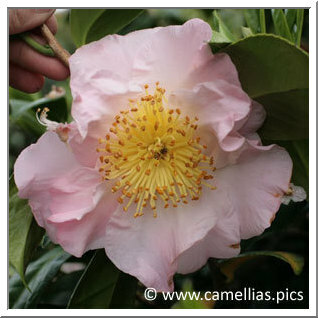 Start by taking a walk in your living area to see whether there are camellias in the gardens, it is a good indicator. If they are large (several meters), it is a very good sign. Choose a camellia when it is flowering, in autumn for sasanqua, between the end of January and April for japonica and hybrids. Do not hesitate to make regular visits to your nurseries to compare the different cultivars. All do not flower at the same moment. Thus, you will be able to judge the flower colors, their size and their form. Because there is an infinity of combinations, the choice is delicate and very personal. Buy rather a small subject, with buds, it will restart growing faster than a larger one. Moreover, you will certainly have a first flowering, perhaps not important. 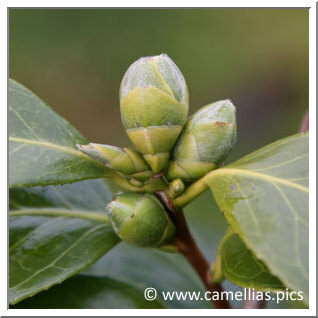 Nothing is more frustrating than a camellia which does not flower after purchase. Always weigh up the plant. It must be heavy compared to its size. If not, leave it aside, it has few chances of restart growing. 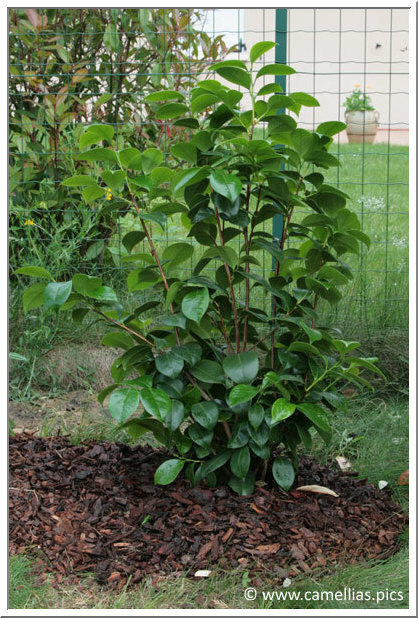 Between two shrubs having identical containers (same diameter), take the smallest, its roots compared to its size are more balanced, it is an additional guarantee. The first question to ask is : where should I put it ? It is imperative to avoid the morning sun, especially on days with frost. The camellias like softness and fear sudden temperature changes. An early frost followed by sudden warming sun rays and all the buds may fall. However, they need some sunshine during the day, avoiding the hottest hours. Camellias like shade, especially the one surrounding trees. 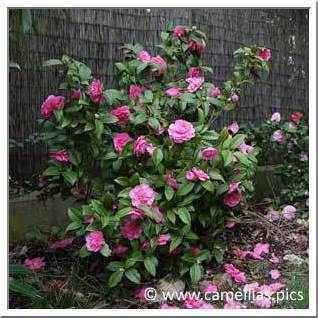 They also like the company of other camellias, you can create clumps and hedges. Their growth varies from one cultivar to another, and depends on growing conditions. Do not hesitate to play with that before installing them in the garden. Deal with the shade coming from your neighbors' shrubs or trees. Try keeping in mind that they need to have sufficient shade and to be sheltered from wind. The sasanqua like sun, adapt your choice to the region you live in. They tolerate drought, need less water, but may be more sensitive to the cold of winter. Their growth can be quite exuberant. Flowering is very long, very abundant and often fragrant (jasmine). On the French Atlantic coast, the climate is ideal, moist and soft. The more you enter into the land (with more pronounced winters), the more you need to find situations sheltered from the wind or to grow camellias in containers. In southern France (which is much warmer), the shade is imperative. Also be aware that there are varieties that grow faster or slower. Some very slow, grow a dozen centimeters per year. Others grow up to forty centimeters on the same period, hence the value of taking a young subject (4 or 5 years) and give it a shape. Some hybrids are supposed to grow over a meter per year. But this varies from one garden to another, depending on the climate and the care they receive. Some have a very loose habit and may be trend as espaliers (eg 'Donation'), others are more rigid and can be grown in bushes (eg 'Adolphe Audusson') or in container (eg 'Coquettii'). It up to you to choose between colors, sizes and shapes of flowers.... knowing that japonica are the most grown, they offer a greater variety of colors, sizes and shapes of flowers. For help, see our glossary. 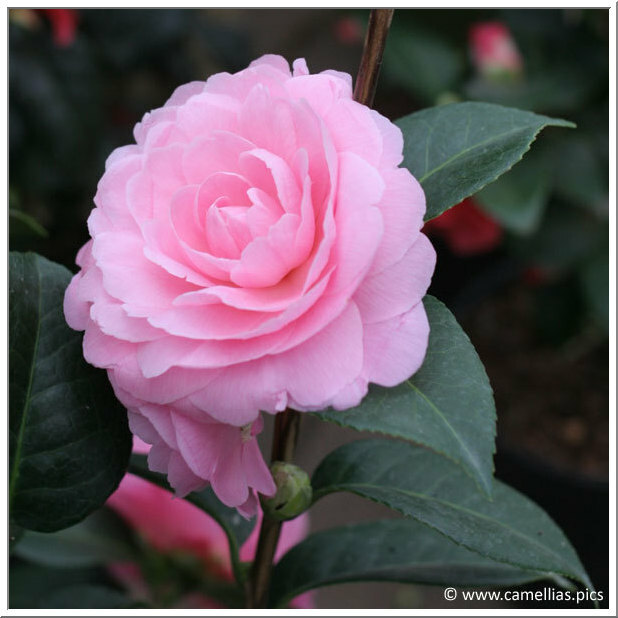 If you want to plant several camellias, you can choose varieties with staggered bloom. But be aware that between the periode indicated on the subject' label in the nursery and when it will flourish in your garden, there may be differences, more or less important. It depends on the winter harshness and the specific climate of your garden. Also, this can vary from year to year. The camellia roots are superficial. Therefore dig a hole wider than deep. Needless to use a plantation veil. This boils down to put it in a pot without ever repoting it. Sooner or later it will stifle... 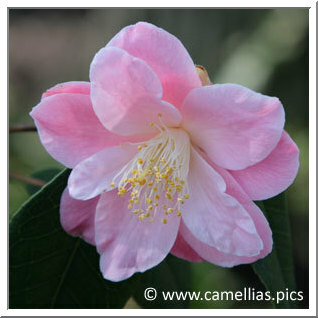 Either your camellia grows well in your garden, either you must be put it in a container. If it does not like it, you'll know it very quickly, it will become dry, eitheir the leaves will fade and fall. If you feel that your camellia does not feel at ease, do not hesitate to seek for another place ... 'Gay Time' was, in our garden, "a traveler", sometimes in the ground, sometimes in containers. Generaly, do your plantations in spring. Winter is gone the camellia has all spring and summer to settle down. For sasanqua, let them spend the winter in a container that you will put in a shelter when it freezes. For others, wait for the end of March, unless you are in an area where frosts are very rare. You can plant a camellia in bloom, this is the best time to do that when the root activity is at its minimum, then the recovery is better. In general it is best to use a real mixture of heath land / soil, equally. If you have the possibility, a very acid soil aerated (roots will settle better) is ideal. The rootball should be at the groung level. Do not pack it too much, it is better to complete with soil and it will give space for the roots to grow. Then I spread pine bark, or even better, dead leaves (it's extra food). The soil should never get dry. 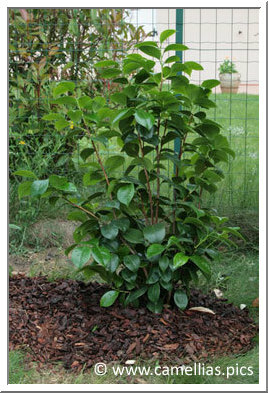 Feel free to mulch heavily around the bush, roots will spread but will remain at the ground level. You must be careful with fertilizer. Too much fertilizer and the plant dies, especially in containers. You must use some once a year, just after bloom. I've tried many fertilizers, to make my mind. I started with a fertilizer with anti-chlorosis, because my water is chalky. Then I tested a slow dispersion fertilizer and finally crushed horn. It is up to you to choose according to your preferences. But always choose a fertilizer suitable for camellias and it is better to use small quantities. Nevertheless, fertilizer is essential for good flowering. 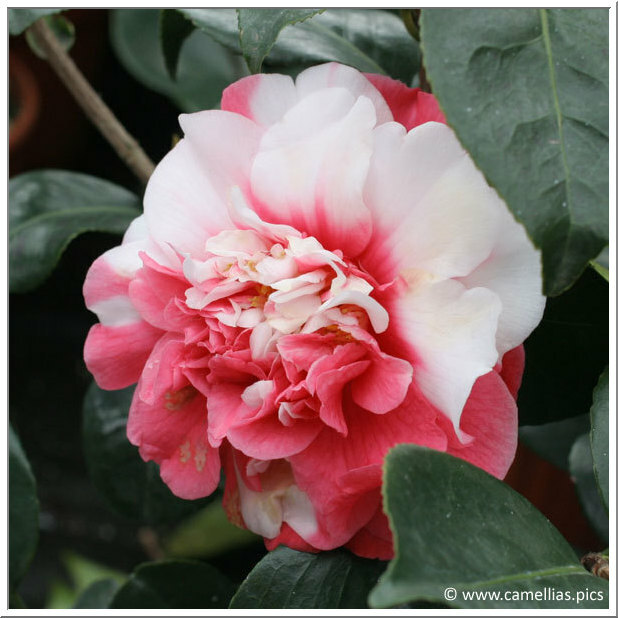 Depending on the fertilizer used, your camellia can take different colors. For example 'Adolphe Audusson' makes its flowers more or less bright red if I use a slow dispersion fertilizer or a classic one. The camellia likes moisture. Its foot must stay cool, but should not be drowned. 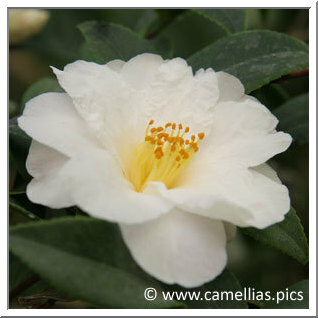 If its drowns, the camellia will lose its leaves. 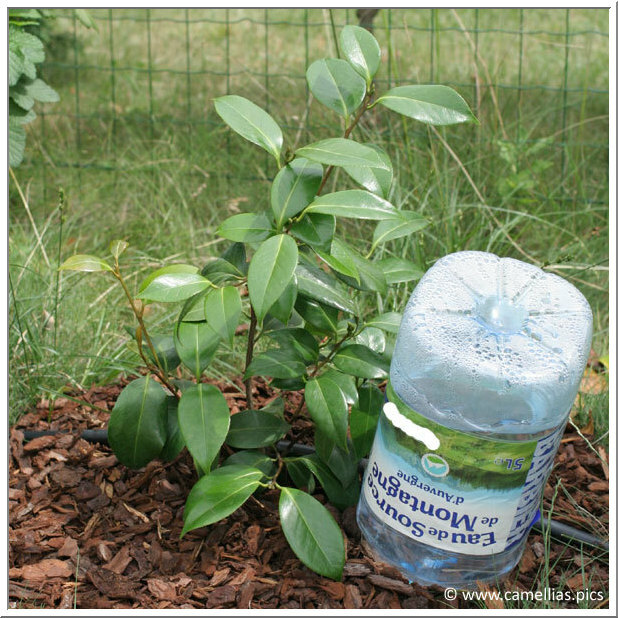 In this case, reduce watering and, if its in a container, check drainage. In summer, when the air is hot and dry, give it a shower the evening. We always say it's better to use a non chalky water. Everything depends on water hardness and the frequency of watering. Don't water every day, let mother nature take its course and complete. So, a little chalky water is not an obstacle. Watering (in rain) should be regular throughout the buds maturation, ie between two flowering period. Be very vigilant during spring, but especially in summer and again in the fall. Otherwise, the bloom will be of lower quality: the flowers will not last as they should and they will fall very quickly, which is abnormal. Keep an eye on its foot. A camellia may quickly die of thirst. If the soil is dry because of lack of watering, it should be remoisten very slowly. Otherwise, this "water shock" can make the buds and flowers fall. In summer, I usually use a bottle with a porous cone to irrigate them. This drop by drop technique is very beneficial. They grow a lot when they are watered in this way and I can leave for holiday without fear. It is a vast subject. Pruning is not mandatory, but I strongly recommend it, even for subjects with slow growth. It is said that pruning promotes a beautiful flowering, I think a good fertilizer does so. One does not go without the other. The more a camellia gets old, the more it will bloom if you treat him well. If pruning is done, it must be at the end of flowering or, if the shrub is already well developed, during flowering (to make bouquets for example). ou will find details on this page. Older subjects can also be pruned, on the photo below, the centenarian camellias from the Domaine de Trévarez. You must protect the camellia foot and banish winter veils. You can, exceptionally, make a "tent" for camellias in containers that you can't shelter. This is valid when the temperature falls below -5° (23° Fahrenheit), but this must be an exceptional measure. I lost two of my first camellias because of winter veils... The camellia is a tree and experience shows that it can live very well without winter veils, especially when it gets older. Be careful the first winter, hence the precaution of planting at the end of it, when all danger of frost and thaw is over. When it snows, shake the cammelia so the light snow can fall. If snow gets hard and freezes, do nothing, otherwise you will make the buds fall while trying to remove the snow. 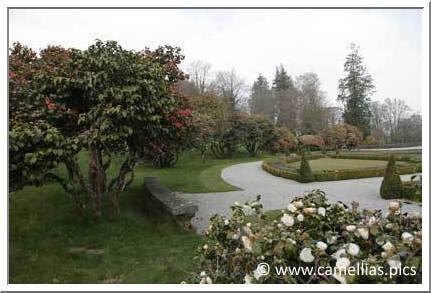 I know several meters high camellias, which see snow every winter without protection. They live very well and flower profusely when the time comes. For me, there are two cold hardiness. The plant's and the bud's. This is the first that I indicate sometimes in the nomenclature. But don't take it literally. That's why I remain very cautious on the subject. It is better to reason according to your region and your climate. The number of days of frost and snow and their intensity are to me much more important. A camellia, well installed in the ground, can bear some hard but short frosts (eg 'Gay Time', 'Cinnamon Cindy', very rustic by nature). 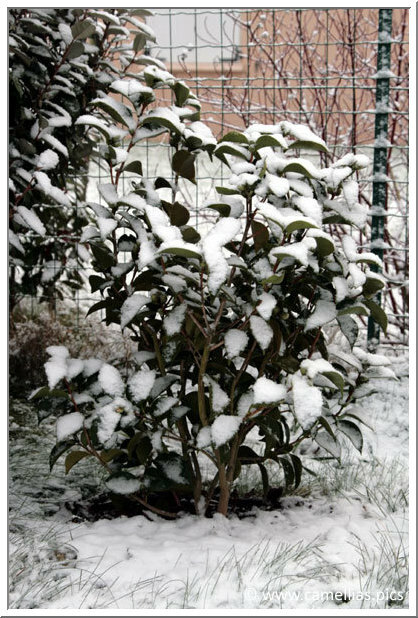 Both camellias have a rather exceptional cold hardiness (-27 °, ie -17° Fahrenheit). Higos are, by nature, very hardy and Belgian varieties are also adapted to the harsh climate of Belgium). Their are also very resistant American varieties (eg: 'Winter's Joy'). On the right, 'Colletii', a japonica from Belgium. The second cold hardiness, which I believe is most important, is buds' cold hardiness. I saw, one winter, buds withstand freezing at -10° C (14° F) and after a slow thawing (rapid thawing can be catastrophic), camellia flourish because the buds' maturity was not advanced during frost. On the other hand, 'Gay Time' which was almost in bloom at this time, saw all its flowers dotted and with holes. 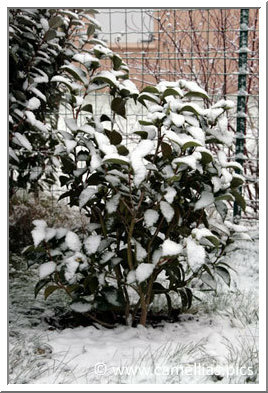 Therefore I can not recommend growing in the ground camellias in areas where frost is long and rigorous. In this case, using containers is necessary, because of the opportunity to shelter them during difficult times. 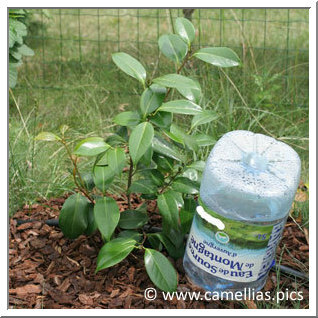 In case of doubt, first test exposure leaving the camellia in container and, if all goes well, put it in the ground. 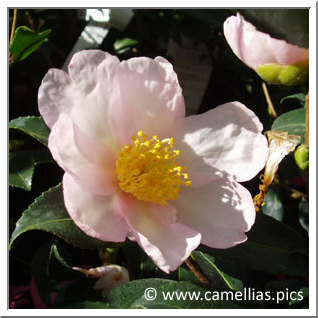 If your climate is a bit harsh and you really want to grow a camellia in the ground, choose a late cultivar, the buttons will less likely be damaged by frost. Look for a very sheltered exposure, it is a very important fact. All my camellias are very sheltered, it makes a huge difference with them in ground. I move inside those in containers when it gets too cold. A garage just above freezing temperature is enough and I take them out when the temperature is acceptable. 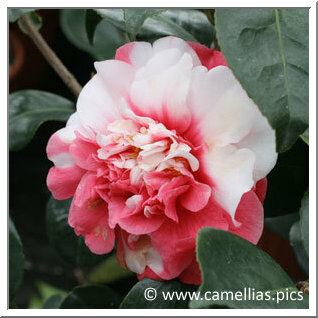 Contrary to what is often said, camellias can be grown quite well in containers. You must select a slow-growing variety. Then, either you choose an already large subject (7 years, for example) to be immediately satified, either you choose a smaller one (four years old), to have the pleasure to shape it. The ideal container size is 50 cm height (maximum) with the same depth. After purchase, re-pot it in a container two centimeters wider. Until it reaches the maximum size of the container, repot it every year in a pot centimeters wider, only if the roots have conquered all the available space. The ideal is a clay container. Avoid rounded forms. 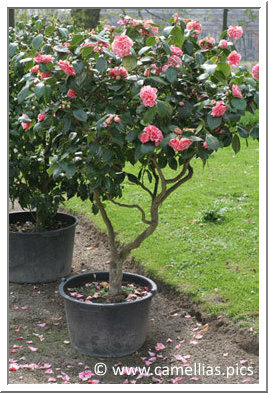 When the roots fill the whole space, you may have to break the container to remove the camellia. It is often recommend to avoid plastic container because the roots can be heated. I would be more nuanced. In regions with warmer climate (south-west or south of France), it is better to prefer clay. I would make the same choice for a camellia that lives on a terrace and which do not move. Personaly, apart from very young plants and small seedlings, they are all in plastic containers, it's easier to move when winter comes and they do not suffer from the heat, even on the terrace. If it's really too hot, I can always put them in the shade. 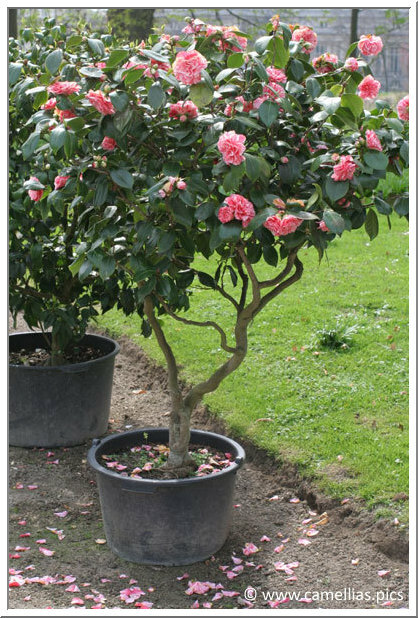 Once the maximum size of container is reached, every year in spring, you must remove the camellia from its container and cut 5 centimeters of roots in thickness and height. Repot with fresh substrate. In the fall, I surface with "new" soil. It's worth checking every year in spring, the condition of the roots and the filling of the container. Some young subjects require repotting every two years, surfacing is enough for them. If growth is very rapid, you may need to repot bith in spring and fall, each time in a slightly larger container. I installe them in the same mixture descibed above. Then I straw and I watering carefully. You should particularly monitor the drainage and do not let water stagnate in the saucer under the countainer. Be careful, a container can drain poorly. You see water drain away, but basically it creates a kind of "mash" that rots the roots. If the leaves are falling in large numbers and get yellow, check the drainage. You could very quickly lose the camellia. Do not forget to water them in winter, with less quantity, but not in great period of frost, of course. You should be parsimonious on the quantity of fertilizer you use, in containers, it can easily burn the roots. I recommend using slow dispersion fertilizer, perfectly adapted for this particular type of culture. After planting, no need to add fertilizer, wait until the following spring. On the right picture you can see the signs of a long and beautiful bloom to come. Buds have many different sizes. To summarize, choose a location sheltered and shady, then anhabit and a color. You can find help by using our search function. Watch carefully the watering, give some fertilizer in spring, do not cover the plant during winter and leave it alone .... the camellias grow so much better this way !